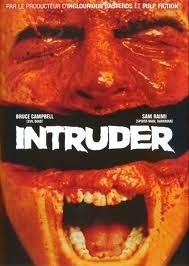 1989’s “Intruder” was pretty much an instant cult classic. The amount of genre talent involved coupled with the over the top gore effects made it an underground hit with horror fans, though easily acquiring an uncut version was far from easy until a few years ago. I was lucky enough to win an autographed copy of Synapse’s recently released Blu Ray / DVD combo pack of the film. It was the first time I’d ever actually seen the film, though I’d obviously heard a great deal about it. In fact, it’s such a cool package / movie that it may actually be the best thing I’ve ever won. Though I do apparently have an autographed Blu Ray of “The Thing” on the way, but I’m not getting my hopes up, just in case. 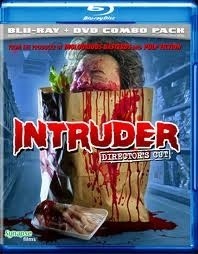 The plot revolves around a local supermarket that is in the process of closing down for the night. The staff has been told that the owners are selling the store (much to the chagrin of one of them) and they will soon be unemployed. To make matters worse one of the cashiers is attacked by her (recently released from prison for murder) ex boyfriend, who escapes and hides somewhere in the store. As the staff search for him, they are (naturally) picked off one by one. Is it the ex boyfriend bent on revenge, or someone else ?! The plot is pretty much an excuse to use one location and a small set of actors on a shoestring budget. It’s essentially a showcase for the gore effects (the first movie by the now huge KNB effects team) which are pretty gross / spectacular. 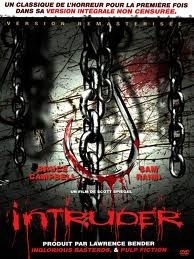 “Intruder” is best known for being directed by the co-writer of “Evil Dead 2” (as well as director of the surprisingly decent direct to video “Hostel 3”) and starring genre vets Bruce Campbell (Evil Dead Trilogy), Ted Raimi (Xena), Renee Estevez (The West Wing) and Sam Raimi himself (Director of The Evil Dead and Spider-Man Trilogies). As previously mentioned, the gore effects are front and center here, and wow, did KNB ever outdo themselves. You don’t really expect a movie like this to look as good as it does, but with Synapse’s new 2K Blu Ray transfer, the gore really pops out at you (luckily not literally). It was interesting to hear about the making of and behind the scenes aspect of this film. It’s especially wild to think that both Sam Raimi and Scott Spiegel were making short films at the same time in relative proximity to each other. 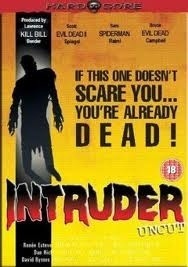 “Intruder” was actually adapted from a short film of Spiegel’s called “Night Crew”, and is certainly his “Evil Dead”. 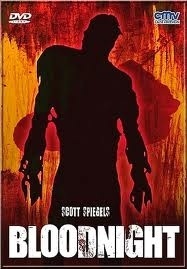 To watch Raimi’s (and similarly Peter Jackson’s) progression from a low budget gorehound to a big budget trilogy director has been pretty wild to see, and you sort of have to feel for Spiegel in that regard. Still, he, Ted Raimi and Bruce Campbell will always have work as side characters in Sam’s films, so that’s something, right ? 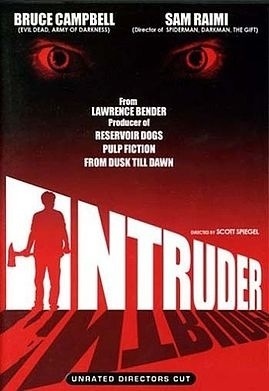 If you’ve heard of or know anything about “Intruder”, you probably already know what you’re in for. It’s a (sometimes intentionally) funny, gory, low budget romp while at the same time maintaining a mystery as to who is behind the killings (unless you see any of the posters or DVD/VHS covers that give away the killers identity. Whoops. 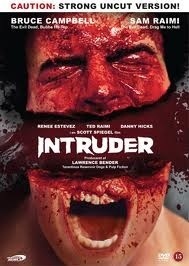 In closing, “Intruder” is exactly what you’d want or expect from a low budget slasher film. 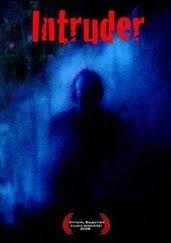 It has multiple deaths, some laughs, adequate tension and an interesting cast. It’s certainly not for everyone, but the mere fact that there is an excellent HD version of this available is pretty respectable. This entry was posted in Reviews and tagged 2012, blender, blood, classic, comedy, cult, evil dead, gore, Halloween, Horror, Horrorthon, hostel, intruder, low budget, murder, October, review, Scary, wafer by lazron. Bookmark the permalink.